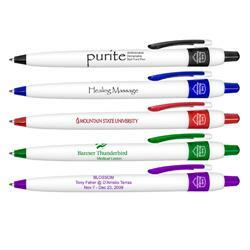 Our new Purite Antimicrobial Pens with your promotional logo. Antimicrobial Pens contain AgION Antimicrobial Product Protection, an EPA registered additive which inhibits the growth of bacteria, mold and mildew. Liqui-Mark products incorporating AgION Antimicrobial chemistry are ideal where vigilance in the war against bacteria and mold is critical, such as schools, homes, medical offices, hospitals and laboratories. AgION Antimicrobial Chemistry is built into the markers and pens during manufacturing and will last the life of the product. Available Colors: Black, Blue, Red, Green and Purple. White barrel. Production Times Available: 7-Day Standard Production. Typical Imprint Area(s): 1" X1.75"
Available Imprint Options: Color Print as Shown. 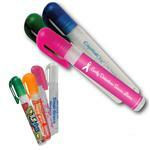 Antimicrobial Pen, Black Ink, White Barrel, Great for Hospitals, Nursing Homes, Etc. Bulk 250 @ 7 lbs.